12 km from Châlons-en-Champagne, 30 km from Reims. 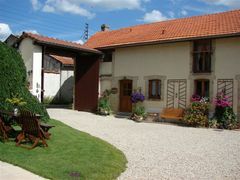 In the vineyards, on the Champagne plain, Martine and Michel welcome you to their renovated farm. Enjoy the patio with garden furniture, the enclosed yard, the garden shelter and the shady ornamental garden with barbecue. Detached house with three bedrooms. Ground floor: 1 double room (disabled access) with en-suite shower and toilet. First floor: 1 double room (+ stowaway bed) with en-suite bath and toilet, cot, 1 family room with 2 double beds + 1 single bed, en-suite shower and toilet. Access to kitchen facilities (no extra charge).